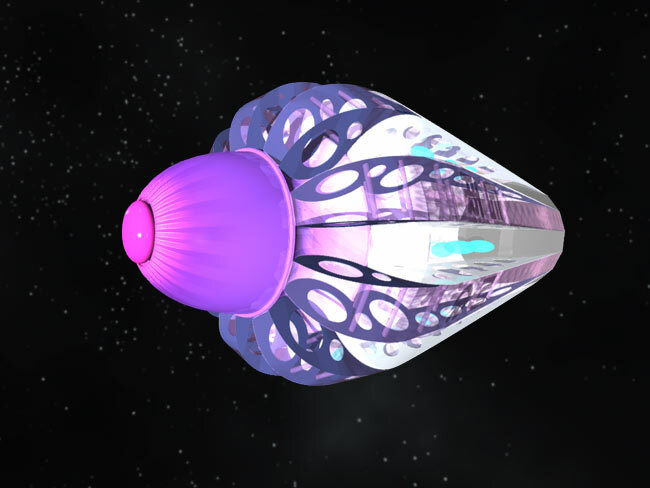 Newclear jet propels doogmints solarwide to areas affected by man-made disasters, where this pollution-hungry spacebloom converts problematicles into apiflazminger. A shuttlecock-like coroot holds an aquamarine pucore in its centre. A neon pink navelipe crowns its tip. A thin black ring floating just above the pucore is called oracling. It is held in situ by a weak electromagnetic field. The coroot has two magnetic grooves. One holds nine silver spikes; the other nine pink-tinted solpans. Each spike contains three aquamarine liquibeans, also called beanbons. The doogmint can be found in a variety of shapes, ranging from a tube to a fully opened star. 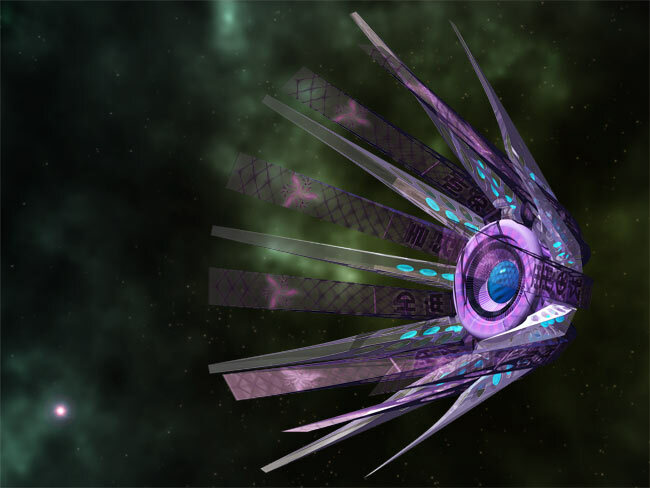 While the raybeams stay uniform, the solpans widen or narrow since their shape and efficiency is related to their position. Widely distributed across deep space and cynmiklae between and around inhabited regions. Also present in hucospheres. Large farmers' fields around Gerehe and Linterraix. Flymation: vertebrae train. Flomation: auhasard, polyla fields and diformae. The shuttlecock, spikes and solpans are not edible. The pucore, beanbons and the navelipe are excellent sources of fibre, vitamins and carbohydrates. The oracling is made of carbontape wrapped around a soft core filled with one of the edible, randomly sequenced trufroo enows. (Top three flavours by probability: borumbee, fabitele and oranget.) The shuttlecock stores raw untagged apiflazminger, a sound-absorbing material used in many products, such as Aleila Beeaime's famous noiseless zipper and cutlery. Simple bouncebaks. Disable via *BB(off) or *AMTEY. 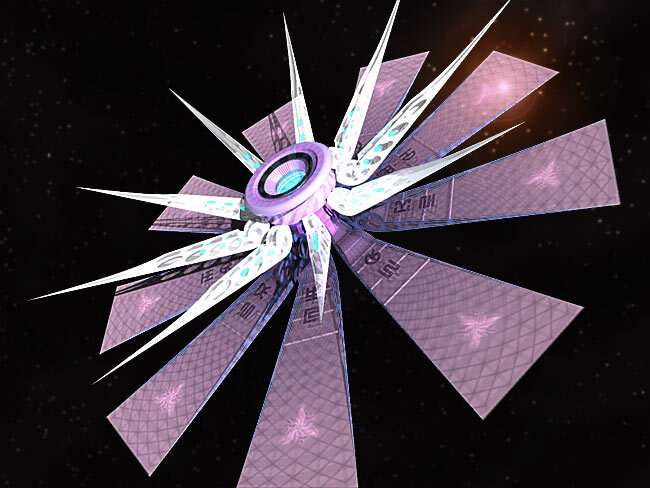 The black oracling above the shuttlecock must be in place. If it is missing, it indicates an imbalanced pucore and a possible doogmint-wide spoilage due to elevated levels of glut-inducing laifarcapinon. Although present in low levels in many spaceblooms, high dosages of laifarcapinon cause temporary, high fidelity, reality distortion. Repeated exposure will result in permanent actuality blindness. Where would culinary philosophy be without goodwill blusopa? The impossible-to-categorize soup recipe, created by mapping Immanuel Kant's thoughts on goodwill to primary food elements, may not renew your beliefs in humanity, but it will deliver a daily recommended intake of nutrients. Alumin Tanwantze's post-doctoral marvel in XOver food science drew some predictable criticism along with this uninformed comment from Worabo Tufure: "Is it not possible that correlating fats to ideas on infinitely quantifiable goodwill may produce an endlessly fattening meal, resulting in an obese population?" Fear not such a result! The soup is finite. Abox 1L of mashed peeled pucores, bebox the navelipe, and cebox all the beanbons; unimbler axt+1a. Add 30 g ahasmiks to the A box, bebox 6 fluuts, and cebox 1L roplet of the mineral water Autofuzzy; unimbler axt+1b. Serve immediately. For a quick juicy spread, abox beanbons with the pink navelipe, bebox a squirtlet of vanilla yum-yumi; unimbler do32. Spread the sosmamell on a slice of sourdough. On second thought, do not bother with the bread. The solpans, apart from working as an auxiliary power source, can identify and catch pollution particles that are subsequently processed. Depending on the type of pollution and its location, some substances are released while others are stored and mixed to create apiflazminger. Mild spearmint aroma, a by-product of the transformation, can surround the doogmint.